"Necessity is the mother of invention," the old saying goes. If you've got a problem that must be solved but no proven way to solve it, you're going to have to get creative. Fortunately for Bethesda, fixing Fallout 3's shooting didn't require a new invention—in fact, it required them to look to the past. When they sat down to make Fallout 3 (the precursor to Fallout: New Vegas), someone at the table must have pointed out the obvious: The current tech that Bethesda was using, a combination of the aging Gamebryo engine, Havok Physics, and other middleware in varying states of decrepitude, was simply not up to supporting an enjoyable first-person shooter. And yet if Fallout 3 was to be a first-person game, it was going to involve guns, and shooting. What to do? The answer was written right into Fallout's DNA: V.A.T.S., or, the "Vault-Tec Assisted Targeting System," wound up being the perfect solution to Bethesda's shooter problem. It's also the system that largely defines both Fallout 3 and Obsidian's Bethesda-published sequel, Fallout: New Vegas. Over the last couple of weeks, I've been returning to New Vegas and writing about it. I played twelve or fifteen hours of the game back when it first came out in 2010, but never truly got "into" it. Given that there's no vast open-world RPG this fall, I figured New Vegas might provide a good counterpoint to all the shooting, driving, stealthing and tactics-ing I was doing in other games. I was right. It's amazing, really, just how well V.A.T.S. works. The action and shooting in New Vegas is remarkably bad; ancient feeling, crusty to a "free demo of off-brand 1994 FPS that came with PC Gamer" degree. Enemies float across the terrain, hovering left and right and shooting you. Your character slowly meanders backwards as your gun's huge iron sights pop up and obscure everything in your path, making it impossible to aim. A couple of melee enemies make a beeline towards you, swinging and yelling, and in about three seconds, you're dogmeat. Non-V.A.T.S. firefights in New Vegas feel jagged, shouty, disconnected, and altogether strange. Whoops, you've been flanked by a flamethrower-wielding lady you missed the first time around! Better freeze time again. And yet with V.A.T.S., battles become distinctive, satisfying, tactical, and even humorous. If only more first-person games had some sort of option that let you freeze time with a button and ponder your options! (Okay I guess they do... the pause button. But that's not what I mean. And bullet-time, while similar, doesn't count—I'm talking freeze time here.) "Okay, this guy charging me needs to be dealt with, so I'll shoot him a couple of times, then I'll have to unfreeze time and reposition over behind that dumpster..."
Double-tap into the dude in slow mo, then make your next planned move, dodging fire as your action points recharge. Whoops, you've been flanked by a flamethrower-wielding lady you missed the first time around! Better freeze time again. I'm not sure I've ever seen a single system so effectively flip a game from bad to good. Imagine if Fallout 3 hadn't had V.A.T.S., if it had featured real-time combat like Oblivion and Morrowind before it. Oh, the overall game probably would have been fine—the vast wastes, the hidden environmental storytelling, the crusty, lonesome wonder of it all; none of that would have gone anywhere. But it wouldn't have been anywhere near as fun. In fact, V.A.T.S. makes it a bit tough to go back to Skyrim. 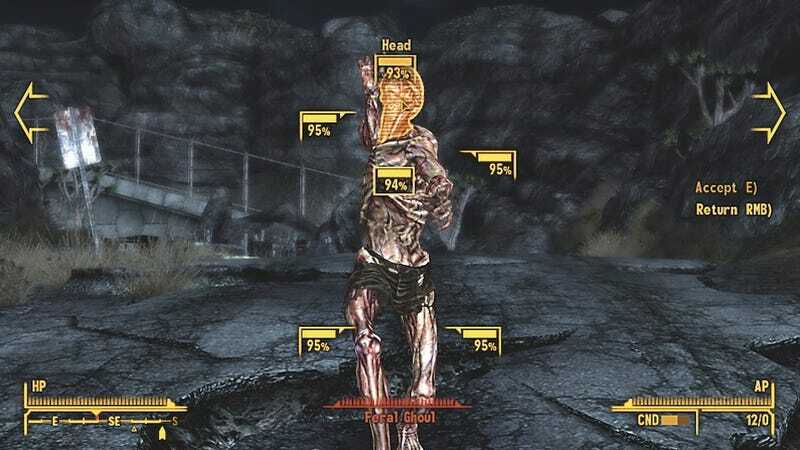 I've been picking my way through that game's first downloadable content, Dawnguard, and after a weekend with New Vegas, I regularly found myself hitting RB to trigger V.A.T.S., only to accidentally unleash a fireball on the air in front of my character. It's a shame, really, that there's not yet a V.A.T.S. mod for Skyrim. Despite plenty of expressed interest over at The Skyrim Nexus, no modders, however industrious, have made it a reality. As much as Skyrim's combat improves over Oblivion, I would devour a V.A.T.S. archery system in the game. Those slow-mo kill-cams even feel like V.A.T.S.—why not just go ahead and build in the rest of the system? Hey modders, you're amazing. Can you put this sucker together? The world will thank you. Truly, for my energy-weapon totin', headshottin' badass wasteland chick, V.A.T.S. is the alpha and the omega. It's the entire reason she's able to own the battlefield, and it lets me keep the initiative instead of constantly just backpedaling and holding down the trigger. The "Project Nevada" mod I've got installed ostensibly makes the game more like a first-person shooter, but while it does feel a bit smoother, it still has that janky action-figure feel that makes shooting in Fallout so generally unfun. V.A.T.S. singlehandedly makes Fallout: New Vegas fun. In fact, V.A.T.S. makes it a bit tough to go back to Skyrim. So now I'll pause for a second and imagine the future: Can you imagine if the next Fallout, let's just call it Fallout 4, had combat that was actually good on its own? Enemies who use the environment intelligently and are animated smoothly, whose A.I. has gradations and whom you can hide from, re-ambush, and confuse? Imagine an aiming and shooting feel that felt closer to, say, Borderlands 2. Okay, now imagine that on top of all that, you also had V.A.T.S. Suddenly, the system would feel less like a band-aid and more like a garnish. Considering how enjoyable V.A.T.S. already is, I'd welcome that with open arms. How about you? Any games you think would do well with a V.A.T.S.-like system? Also: I never play as a melee character, but how is that with V.A.T.S.? Does it bug you how using explosives with V.A.T.S. almost never works, since enemies run right past your grenade? Share your V.A.T.S. stories here, folks. I'll be playing a lot of Need For Speed this weekend, but I bet I'll break it up by continuing my treks across the Mojave Wastes. I'll have more Return to New Vegas posts up next week.